Take good flour, Ale yeast, saffron, and salt. And beat all together as thick as other manner fritters of flesh; and then take Apples, and pare them and cut them in manner of fritters, and wet them in the batter up and drown, and fry them in oil, and cast them in a dish, and cast sugar thereon enough, and serve them forth hot. Whisk together flour, beer, saffron and salt. The batter should be somewhat loose. Let the batter stand a little bit. Peel the apples, remove cores and slice into rings. 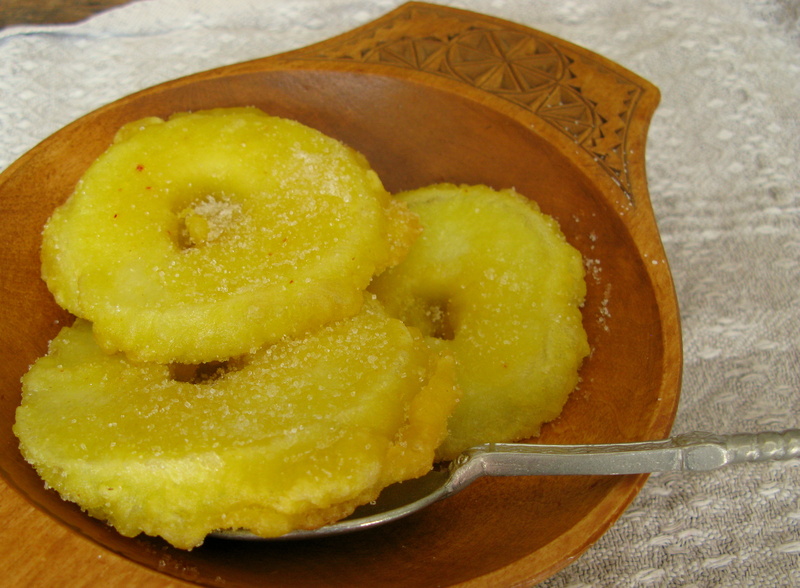 Dip the apple rings into the batter and fry in oil. Lift the fried apples on top of the paper to dry for a while and garnish with sugar. Serve hot.